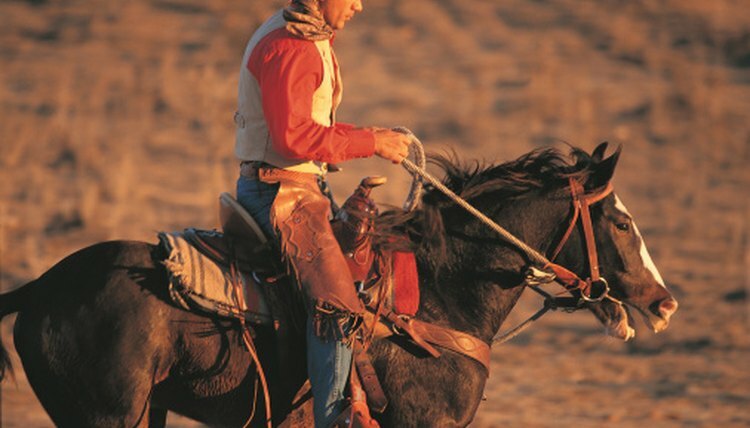 Reins attach to the bit loops of a horse's bridle and are used by the rider to give directions to the horse. Pulling on the reins will pull on the bit in the horse's mouth, signaling which way you want to go. You can make your own reins from a length of rope simply by securing an eye snap to each end and then attaching the snaps to the bridle. Making your own reins allows you to customize the details such as length, color and type of rope used. Cut a 1/2-inch cotton or nylon rope to 8 feet and 8 inches long. Run the flame of a lit match back and forth over each end of the rope to melt the strands together to prevent them from fraying. Thread one end of the rope through the eye portion of a swivel eye bolt snap. Pull 4 inches of the rope through the snap. Bend the 4-inch tail of rope back on itself to form a loop. Repeat this step on the opposite end. Place a rope clamp over both portions of rope at the bottom of the loop, 1 inch from the end of the 4-inch tail. Position the clamp so that its teeth grasp the rope ends. Repeat this process on the opposite end of the rope. Use a pair of pliers to squeeze the wings of each rope clamp closed over the rope. Ensure that the rope clamps are tightly crushed around the rope lengths so that they won't fall off. Hook the ends of the reins to your horse's bridle by attaching one snap to either side of the bit.